If you know someone that isn’t big on flowers for Valentine’s Day. Why not give them something they really love. 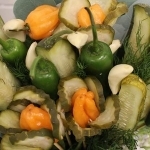 Valentine’s Day is coming, and it’s a really big dill. A great time to remind loved ones (spouses, moms, dads, dates, baes and kids included) just how much they really mean to you, the day calls for kind sentiments. Though a card or some roses fit the bill, why not go the extra step this Feb.